The adsorption characteristics of 4-chloro-2-nitrophenol (4C2NP) onto single-walled and multi-walled carbon nanotubes (SWCNTs and MWCNTs) from aqueous solution were investigated with respect to the changes in the contact time, pH of solution, carbon nanotubes dosage and initial 4C2NP concentration. 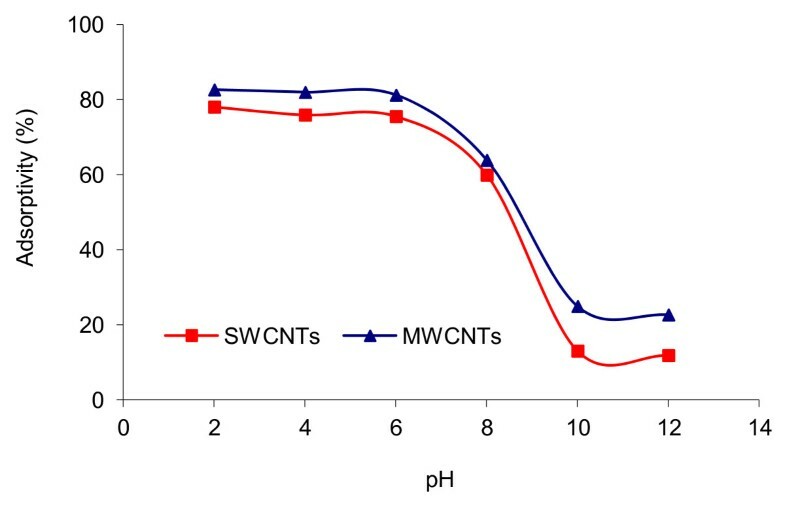 Experimental results showed that the adsorption efficiency of 4C2NP by carbon nanotubes (both of SWCNTs and MWCNTs) increased with increasing the initial 4C2NP concentration. The maximum adsorption took place in the pH range of 2–6. The linear correlation coefficients of different isotherm models were obtained. Results revealed that the Langmuir isotherm fitted the experimental data better than the others and based on the Langmuir model equation, maximum adsorption capacity of 4C2NP onto SWCNTs and MWCNTs were 1.44 and 4.42 mg/g, respectively. The observed changes in the standard Gibbs free energy, standard enthalpy and standard entropy showed that the adsorption of 4C2NP onto SWCNTs and MWCNTs is spontaneous and exothermic in the temperature range of 298–328 K.
Phenolic derivatives, such as a number of chloro- and nitrophenols are toxic and carcinogenic . Chronic toxic effects due to phenols reported in humans include vomiting, difficulty in swallowing, anorexia, liver and kidney damage, headache, fainting and mental disturbances . 4-Chloro-2-nitrophenol (4C2NP), which was chosen as the model compound in the present study, is recalcitrant and persistent towards biodegradation and is constituent intermediate of many industrial effluents . While the World Health Organization (WHO) has recommended the permissible phenolic concentration of 0.001 mg/L in potable waters, the European Union (EU) has set a maximum concentration level of 0.5 μg/L of total phenols in drinking water [2, 4]. Hence, removal of the phenolic compounds from wastewater before its discharge is necessary in order to reduce their side effects on the environment and human health. Many methods such as biodegradation , photocatalytic degradation , ultrasonic degradation , solvent extraction , ozonation [9, 10] and decomposition by Fenton reagents  may be used to remove phenolic materials from aqueous solution. However, by far, the most frequently used technology is adsorption by a solid phase. Several different adsorbents such as activated carbon , silica , polymeric resins  and zeolites  have all been proposed to remove phenolic pollutants from wastewater. In most cases, the adsorbents have diameters in the range of submicron to micron and have large internal porosities to ensure adequate surface area for adsorption. However, the diffusion limitation within the particles leads to decreases in the adsorption rate and available capacity. Therefore, it is important and interesting to develop a novel adsorbent with a large surface area for adsorption, a small diffusion resistance and a high capacity. The relative large specific surface area of carbon nanotubes (CNTs) enables them to become candidate for adsorption of phenolic compounds [16, 17]. CNTs provide a large specific surface area and a strong Van der Waals binding energy for molecular adsorbates on well-defined adsorption sites such as interior, groove, exterior and interstitial sites . 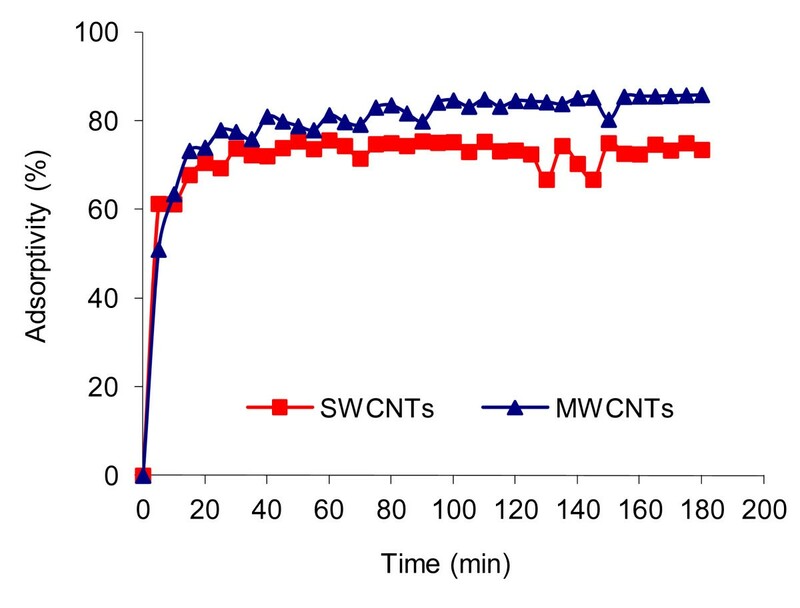 The objective of the present work was to investigate the adsorption potential of single-walled and multi-walled carbon nanotubes (SWCNTs and MWCNTs) for removal of 4C2NP from aqueous solutions. Effects of contact time, CNTs dosage, pH and initial 4C2NP concentration on the adsorption capacity were studied. The Langmuir, Freundlich and Temkin isotherm models were used to describe the equilibrium data. The adsorption mechanisms of 4C2NP from aqueous solutions onto SWCNTs and MWCNTs were also evaluated in terms of thermodynamic parameters. Single-walled and multi-walled carbon nanotubes were purchased from Research Institute of Petroleum Industry (R.I.P.I), of Iran. On the basis of the information provided by the manufacturer, the CNTs were synthesized by catalytic chemical vapor deposition (CVD), and their characteristics are listed in Table 1. 4-Chloro-2-nitrophenol (C6H4ClNO3, Mw = 173.56 g/mol) was supplied by Fluka, Germany. where C0, Ct and Ce are the initial, at any time t and equilibrium 4C2NP concentration (mg/L), respectively. V is the solution volume (L) and m is the adsorbent mass (g). The RL value indicates the type of the isotherm to be either irreversible (RL =0), favorable (0<RL <1), linear (RL =1) or unfavorable (RL >1) . where K0 is the equilibrium constant, T is the solution temperature (K) and R is the gas constant (8.314 J/mol.K) . In order to optimize contact time of adsorption, 0.1 g of adsorbent (SWCNTs or MWCNTs) was treated by 250 mL of 4C2NP solution with 10 mg/L concentration at 25°C. The working pH was that of stock solution (i.e., pH ≈ 6) and was not controlled. The mixture was shaken during different times and left for 180 min and then, was analysed (Figure 1). Rapid adsorption was observed during the first 20 min of contact time and no significant change in 4C2NP removal was observed after about 60 min. Therefore, 60 min was selected as the equilibrium time for both adsorbents in all experiments. Effect of contact time on 4C2NP adsorption onto CNTs; [4C2NP] 0 = 10 mg/L; pH = 6; CNTs dose = 0.1 g; 25°C. To study the effect of SWCNTs and MWCNTs dose on the adsorption of 4C2NP, the experiments were done under the conditions described at previous stage with contact time of 60 min and variable CNTs dosage (0.005, 0.01, 0.05, 0.1, 0.2, 0.3, 0.4 and 0.5 g/250 mL). Figure 2 displays the effect of CNTs dose on the adsorption of 4C2NP. Along with the increase of adsorbent dosage (from 0.005-0.1 g), the percentage of 4C2NP adsorbed increased (from 12.64%-75.62% and 15.6%-81.28%) onto SWCNTs and MWCNTs, respectively. The adsorption of 4C2NP at adsorbent dosage higher than 0.1 g remained almost unchanged. As a result, the CNTs dose of 0.1 g was used in the subsequent experiments of this work. Effect of CNTs dose on 4C2NP adsorption; [4C2NP] 0 = 10 mg/L; pH = 6; 25°C; contact time = 60 min. In Figure 3, the effect of initial pH on the adsorption of 4C2NP onto SWCNTs and MWCNTs at 25°C and initial 4C2NP concentration of 10 mg/L is depicted. As shown, adsorption of 4C2NP remained almost unchanged up to pH = 6, but dropped drastically for pH >6. Thus in the rest of the experiments, to achieve the appropriate condition of adsorption, the pH was that of stock solution (pH ≈ 6) and was not controlled. Effect of pH on 4C2NP adsorption onto CNTs; [4C2NP] 0 = 10 mg/L; CNTs dose = 0.1 g; 25°C; contact time = 60 min. The adsorption of 4C2NP was carried out at different initial concentrations ranging from 2 to 10 mg/L onto SWCNTs and MWCNTs at 25°C. 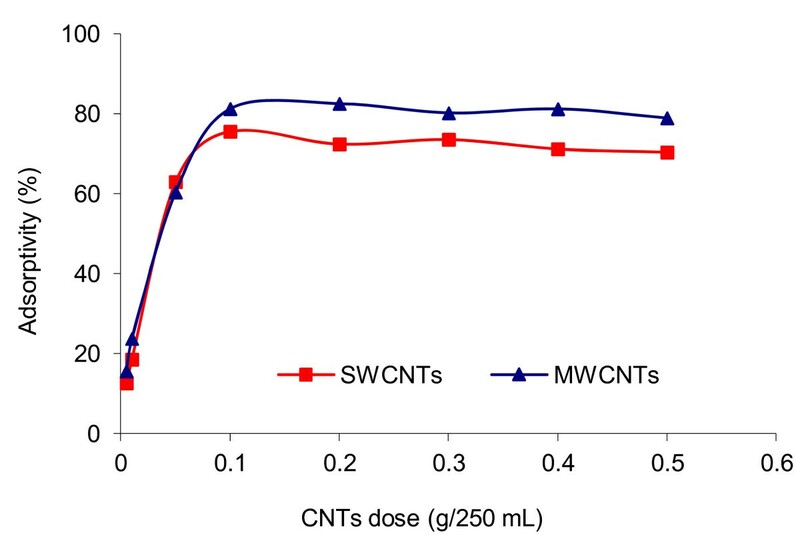 As shown in Figure 4, when the initial concentration increased from 2 to 10 mg/L, the adsorption increased from 33.19% to 75.62% and from 56.96 to 81.28% onto SWCNTs and MWCNTs, respectively. Effect of 4C2NP initial conc. on its adsorption onto CNTs; pH = 6; CNTs dose = 0.1 g; 25°C; contact time = 60 min. 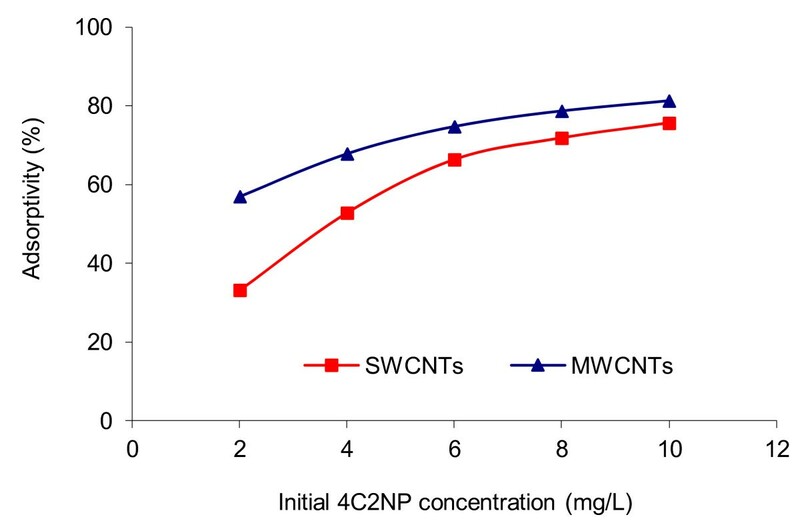 In order to compare the results of adsorption of 4C2NP onto SWCNTs and MWCNTs at various conditions such as pH, CNTs dosage and initial 4C2NP concentration, the difference of 4C2NP adsorption by SWCNTs and MWCNTs has been evaluated by t-test and are recorded in Table 2. 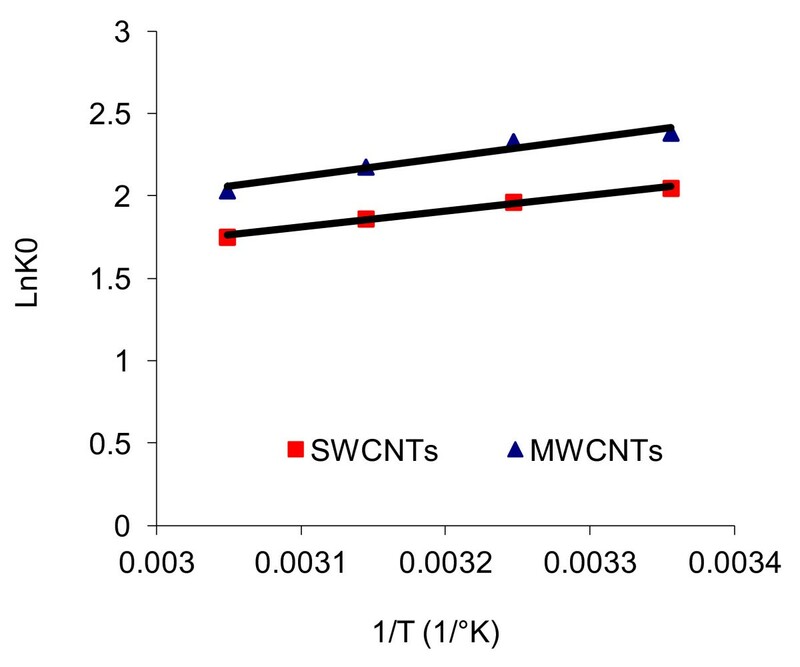 As t critical >t sample , there was no significant difference between the adsorption of 4C2NP onto SWCNTs and MWCNTs (p = 0.05). The values of Langmuir, Freundlich and Temkin parameters were calculated from the slope and intercept of linear plots of 1/qe vs. 1/Ce, Lnqe vs. LnCe and qe vs. LnCe (equations 3–5) respectively. The isotherm constants along with the correlation coefficients are listed in Table 3. It can be seen from Table 3, that the Langmuir isotherm better fited the experimental data (R2 >0.99) than the other isotherms. ΔH° and ΔS° were calculated from the slope and intercept of the plot of LnK0 vs. 1/T using the equation 7 (Figure 5). Standard Gibbs free energies at different temperatures were calculated from equation 9 and the results are summarized in Table 4. Plot of LnK 0 vs. 1/T; [4C2NP] 0 = 10 mg/L; pH = 6; CNTs dose = 0.1 g; contact time = 60 min. As shown in Figure 1, a two-stage kinetic behavior was observed: rapid initial adsorption in a contact time of 20 min, followed by a second stage with a much lower adsorption rate. This is obvious from the fact that a large number of vacant surface sites are available for the adsorption during the initial stage and with the passage of time, the remaining vacant surface sites are difficult to be occupied due to repulsive forces between the solute molecules on the solid phase and in the bulk liquid phase . Also Figure 1, shows that MWCNTs had slightly higher adsorbability than SWCNTs, despite the fact that SWCNTs have a higher specific surface area (550 m2/g) than MWCNTs (280 m2/g). This observation is similar with other researches , which may be explained by the presence more active adsorbing sites for MWCNTs compared SWCNTs. While MWCNTs have three possible sites for adsorption including external surface, inner cavity (the spaces in the innermost graphite tube) and interwall spaces (the spaces between the coaxial tubes of MWCNTs), SWCNTs have only two possible sites including external surface and inner cavity . Based on the results (Figure 2), an increase in the adsorption with the increase of adsorbent dosage from 0.005-0.1 g can be attributed to greater surface area and the availability of more adsorption sites. Above 0.1 g of adsorbent dosage, the adsorption equilibrium of 4C2NP was reached and the removal of 4C2NP remained almost constant. The solution pH is one of the key factors that controls the adsorption process on carbon materials; it controls the electrostatic interactions between the adsorbent and the adsorbate . The pH of the zero point of charge (pHzpc) for SWCNTs and MWCNTs are 2.2 and 4.7-6.4, respectively . At pH <6, since there is no electrostatic repulsion between the non-ionized 4C2NP species and the CNTs surfaces, the adsorption is higher. On the other hand for pH >pKa (4-chloro-2-nitrophenol, pKa = 6.46, 25°C), the phenols dissociate, forming phenolate anions, while the surface of CNTs is negatively charged. The electrostatic repulsion between the identical charges lowers the adsorption capacities. Besides, the phenolate anions are more soluble in the aqueous solution, and stronger adsorbate-water bonds must be broken before adsorption can take place . Similar results were reported for the adsorption of phenol and cresol on carbon nanoporous  and 2-nitrophenol by MWCNTs . It is clear from Figure 4, that the adsorption of 4C2NP onto CNTs was increased by increasing the initial 4C2NP concentration. These results may be explained by the fact that, the initial concentration provides the necessary driving force to overcome the resistances to the mass transfer of 4C2NP between the aqueous and the solid phases. Furthermore, the increase of loading capacity of CNTs with increasing initial 4C2NP concentration may be due to higher interaction between 4C2NP and CNTs . Table 3 revealed that the adsorption of 4C2NP onto CNTs can be described with Langmuir isotherm. It can be seen from this Table that the calculated R L values were between 0 and 1 for both the adsorbents, indicating favorable conditions for the adsorption process. K L values for adsorbents followed the order of MWCNTs >SWCNTs, suggesting that the affinity of the binding sites for 4C2NP on CNTs also followed this order. According to the results (Table 4), the negative values of ΔG° show a spontaneous nature of adsorption. The decrease in ΔG° with the decrease of temperature reveals more efficient adsorption at lower temperatures. In addition, a comparison of the standard Gibbs free energy values indicates that the adsorption onto MWCNTs is more spontaneous than SWCNTs. Hence, the amounts of ΔG° imply that the adsorption affinity of 4C2NP onto MWCNTs is stronger than SWCNTs. The negative value of ΔH° suggests that the 4C2NP-CNTs interaction is exothermic, which is the reason for the increase in adsorption at lower temperatures. Also, it suggests that the rise in the solution temperature dose not favor 4C2NP adsorption on either SWCNTs or MWCNTs. The same effect was reported for pentachlorophenol on MWCNTs . The standard entropy change was found to have negative values for those processes. It mirrors a decrease in the randomness at solid-solution interface during the adsorption of 4C2NP onto SWCNTs and MWCNTs surfaces. The authors thank the financial support from the School of Pharmacy, Tabriz, Iran, specially Dr. Hamidi and Miss Faridi. AM and PG carried out the isotherms studies and participated in the drafted the manuscript. MA and SD carried out the effect of different parameters studies. MM and KZ carried out the thermodynamic Studies. All authors read and approved the final manuscript.